The last month I have been forensically analyzing the KAI OS 2.5, formally FireFox OS. We are seeing a bunch of these feature phones in our lab. PTFinderFE is obsolete do to the new innovations in Volatility. (Updated 10/20/13)My New Volatility Batch File Maker does all that PTFinderFE did and MORE!!! The New Volatility Batch File Maker is a little kludgy but usable. "Thank you" for all the great input. These are tools to find SMS Messages from physical (carve) or logical files, recovered from an iPhone (DOWNLOAD). This tool is really meant to find unallocated SMS Messages in a Raw disk recovery of the user disk partition as extracted by tools (http://oreilly.com/catalog/9780596153595)like the one created by Johnathon Zdziarski. (http://www.zdziarski.com/blog/?page_id=503). If you obtain a logical copy of the files from the iPhone then you can use this tool to parse some of the information out of the SMS.db. 1. iPhone SMS Remnant - Search by Telephone Number.EnPack is a Enscript that will prompt you for a telephone number to specifically search. When you run the script you have to “Blue Check” all files you want to scan. 2. iPhone SMS Remnant - Find All.EnPack is an Enscript that will attempt to find all the SMS Messages regardless of the telephone number. (After you find you "target" telephone number I recommend you use the iPhone SMS Remnant - Search by Telephone Number because it appears to find some additional remnants that this Enscript might miss.) You don't have to use the entire number you can also use just a area code ("414)or an area code + prefix(414935). Do not use and salad (spaces,dashes or wildcard characters). This was tested against an iPhone Version Model MB704 – Revision 3.1.3(7E18). Test SMS.db(s) was SQLite format 3. Sometimes the hits were like "+14145551212" and sometime they were "4145551212"
When creating these ENSCRIPTS I used a "Default Bookmark folder" so if you run these Enscript more then once each in your case, without changing the bookmark folder name, it will just OVERWRITE the previous search WITHOUT notice. A majority of the "False Positives" appear to Call History Remnants. To Do: This tool would be easy to change/update to find call history in allocated (call_history.db) and unallocated space. I updated my Basic Memory Analysis Enscripts (Version 6) and rolled them out at the 2010 WACCI Conference. The newest addition is an Enscript to carve for Windows 7 Processes (Exited and Running). Important ---If you downloaded the new Enscripts prior to 10/17/2010 please update your download to Version 2.1 - I made some changes to the Win7 (Beta) Enscript. The magic number I am using is part of the _DISPATCHER_HEADER of the _KPROCESS. The _KPROCESS is the first entry of the _EPROCESS. All the new Enscripts create a default folder to place search hits and bookmarks. If you run the Enscripts at more then one memory image you will co-mingle hits/bookmarks. And if you don’t rename the folders prior to re-running the script – there is no fail-safe check and your original folder will be overwritten. To run any of the Enscripts just drop them into your main Enscript folder (usually C:\program files\Encase6 \Enscripts). I also tried to use something unique besides the Dispatch Header. I tried to use the following magic number which I believe is the Swap List Entry of the KPROCESS Block. This also missed several processes in my test data. A special “Thank You” to Lance Mueller for his AWESOME Free Enscript Tutorial which was a HUGE Help to me. I know if your reading my blog you've seen ROT13 and know it is used by Microsoft in the UserAssist Registry Key. But now I’ve found Microsoft using ROT(-29) or Rotate Minus 29 which is considerably more devious, then ROT13, for the forensic investigator. 1. First find a computer running Windows 7 or Vista. 2. Open Notepad and type: “ForensicZoneaaaaaaaaaabbbbbbbbbbcccccccccddddddddddForensicZone”. 3. 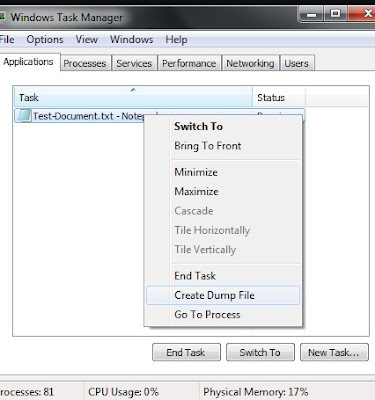 Run Task Manager (taskmgr.exe). 4. Application Tab > Select the Notepad Task >Right Click and “Create Dump File”. 5. Open notepad.dmp using your favorite hex editor. Ok. So it is Rotation (-29) and a conversion to Unicode. - Numbers and most of the Special Characters do not convert to a printable ASCII range. - Capitol Letters are converted to numbers and special characters. - The Unicode also makes it easy to overlook this information. There might be an easy explanation for Microsoft using ROT (-29) but I don't know what it is. If I am way off base or someone else has information about this please let me know. I discovered ROT(-29) while preparing for my presentation for the Wisconsin Association Computer Crimes Investigators (WACCI) Conference 2010. One of the Keynote Speakers I am really looking forward to meeting at the WACCI 2010 Conference is Harlan Carvey. 5.Run Volatility Batch File Maker. -a. Select e:\exemlar6\xemplar6.vmem with “Browse for Memory Capture”. -b. Select e:\exemlar6\exemplar6.txt (created by PtFinderFE) for your memory image with “Browse for Offset Text File”. -c. Create Batch (Which is hidden until the previous listed fields are populated). 6. .Goto the directory containing exemplar6.vmem (e:\exemlar6\) and run e:\exemlar6\vaddump.bat file. 8. Drop the entire vaddump directory and the original exemplar6.vmem into ENCASE (or your forensic tool of choice). 9. Hash all the files (Search>Calculate hash value). In my last post atsxyzd.sys, dxonool32.sys and dw8.exe were identified as suspected malware. We can then create search words out of CLUBCLEZ, KPAN45MJ, 0HEN0X2F and WTE74L2Z(which look like they might be folder names used by Internet Explorer). For every hit in the VAD files there is a hit in the original VMEM File. There is one additional hit in the VMEM file for each search term which we would then try and figure out. 11. Create search term like “http://” and go “cherry picking” you can find a lot of IP Addresses in the suspected malware. It is very easy to find the context to your search hits just by looking at the file they are located in. There is approximately 107 megabytes of VAD files (without duplicates). The total size of the original VMEM is 256 megabytes. That is 2/5 context provided for this dump file. In less then 6 minutes.